Hi, it's Amy Baldwin here with you today! I am very excited to be sharing with you my project debut! 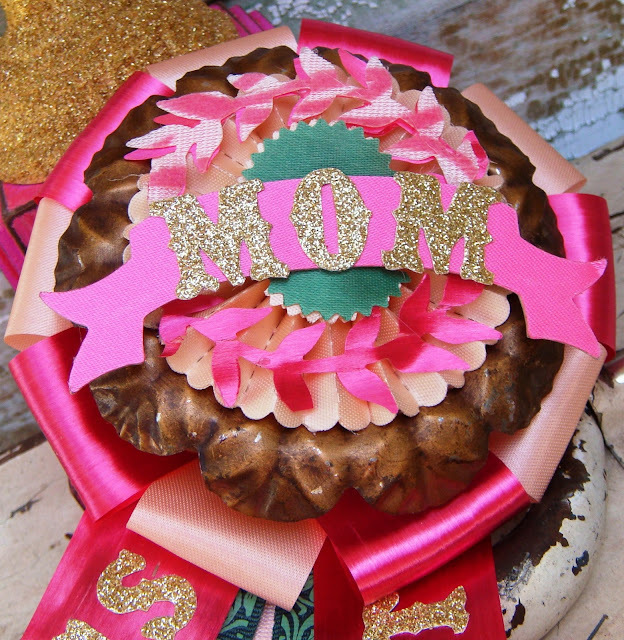 With Mother's Day just a few weeks away, what a great time to show your gratitude for mom with this trophy/rosette ribbon gift set. Not only does it serve as pretty decor for mom, but the ribbon simply slips off and can be worn by mom on her special day! Since the rosette ribbon is the focal point of the piece, we will start here. Using the Vintage Market Sizzlits Decorative Strip, die cut 2 sets of the alphabet out of gold glitter canvas/fabric. I found the canvas is a little thick for the sizzlits die, so using glitter card stock could give a cleaner cut and would look just as good. Round up any vintage materials you want to incorporate into the piece. I used vintage florist ribbon, a flocked shower curtain remnant and an ornate metal lamp ring. Using the Regal Crest Bigz Die & the Paper Rosette Sizzlits Decorative Strip Die, die cut into several strips of fuchsia, hot pink, peach & green ribbons. 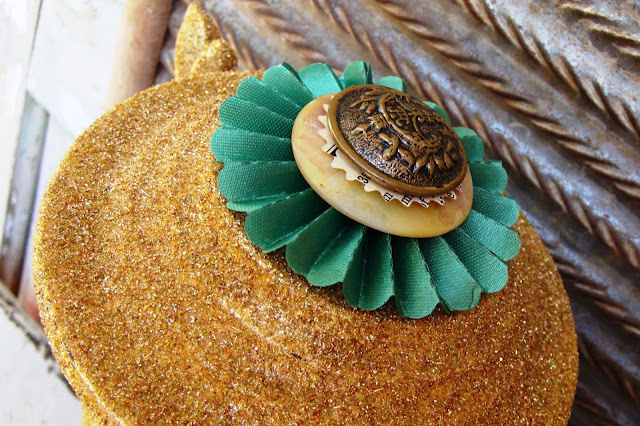 To create the rosette, glue the peach ribbon rosette directly onto the metal ring. Glue the "laurel leaves" around the edges and adorn the center with the banner. To create a sturdier banner, I backed it with a chipboard piece of the same shape. For the letters to stick nicely to the ribbon, run each letter through a Xyron machine and attach "mom" accordingly. 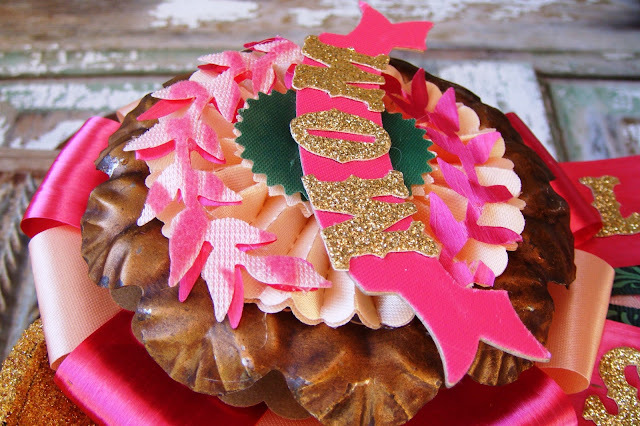 To create the rosette layer behind the metal ring, die cut a 3" circle out of chipboard. Cut 5 ribbon strips 3.25" in length from the fuchsia & peach ribbon. 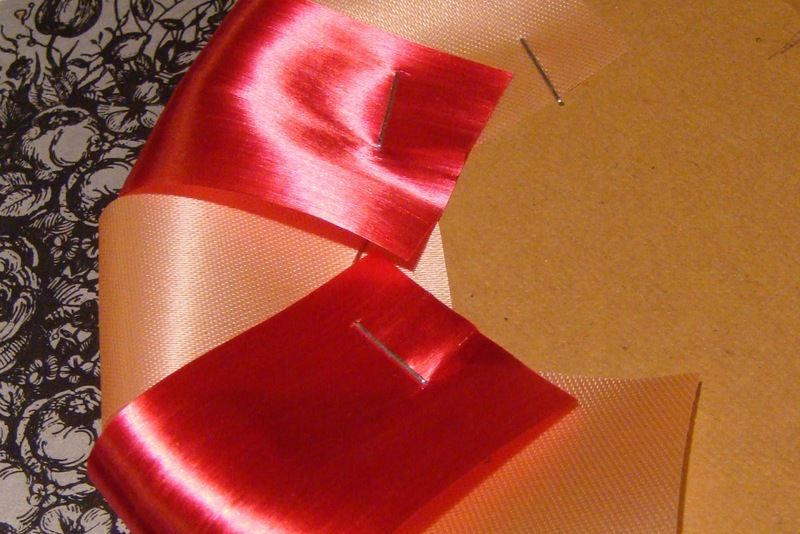 Fold the strips in half around the outer edge of circle and staple each ribbon down as you go. Cut some longer strips of fuchsia ribbon and adhere the letters to spell out "world's" and "greatest," again using your Xyron for good adhesion. Cut additional ribbon "tails" out of more florist ribbon, flocked fabric and some pretty green/aqua ribbon from DCWV. Glue the ribbon tails to the back bottom of the rosette. Create a loop for decorative hanging using waxed cord. (This will serve to hang the rosette directly to the side handle of the trophy.) To enhance the overall integrity, die cut another 3" circle and glue it on the back to cover/protect all the layers. Glue a brooch pin to the back. For the trophy, I combined different trophy parts from my stash. I wanted a heavy/solid base and a trophy cup as a display stand for the rosette. As with most trophies, they have a very cheap brassy look. 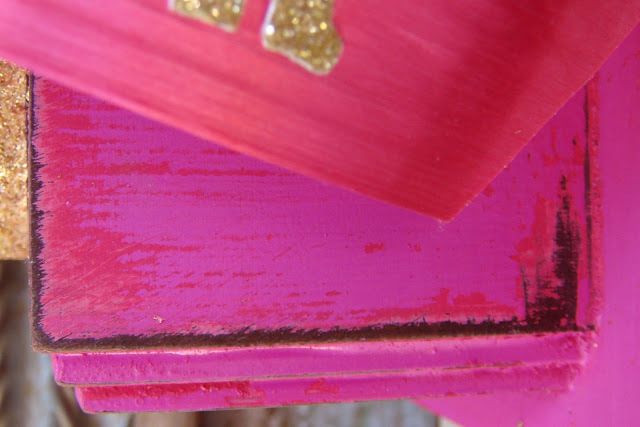 For the base of the trophy, paint the wood to incorporate colors from the ribbon. Giving the wood a distressed look, cover using a variety of paints, ink and then sanding all over. 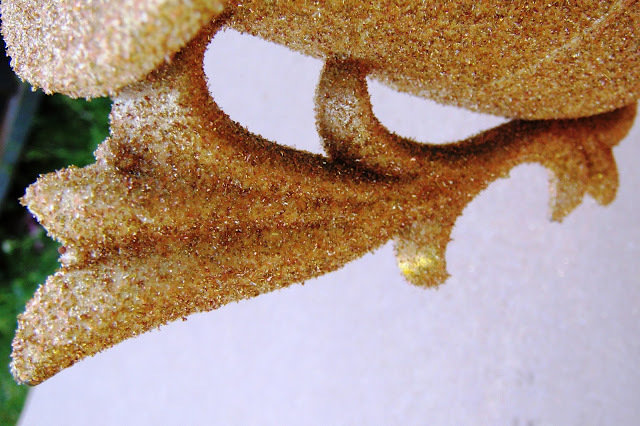 Glue the trophy cup to the base using a heavy duty adhesive. For the very top of the trophy, create a rosette topper so that the ribbon rosette and trophy have a cohesive look. Glue a few vintage buttons to the top and your done! Giving such a special gift to your mom is guaranteed a smile and it is a great keepsake she can cherish for years to come! Sizzix Bigz Die - Circle 3"
Nothing says "I Love You" more than a handmade gift! Visit our die cutting project gallery at Sizzix.com for more Mother's Day project ideas that are sure to put a smile on your Mom's face this Mother's Day! So sweet Amy! Any mother would be proud to receive such a special "award". :) Love it!! The world`s greatest mom prize is beautiful. I really like the re-use of non-papercrafting materials. Thank you for the excellent step-by-step tutorial. I really appreciate the photos for the placement of the ribbon loops stapled to the card. So many possibilities with these techniques. Great project. I love how you altered the trophy, a very improved look for it, I think. I am looking forward to seeing future projects from you. Wowwwwwwww! this is gorgeous!! LOVING the colors!! Introducing the NEW Big Shot! It's a Sizzix Mother's Day! Announcing The 2013 Sizzix Design Team!